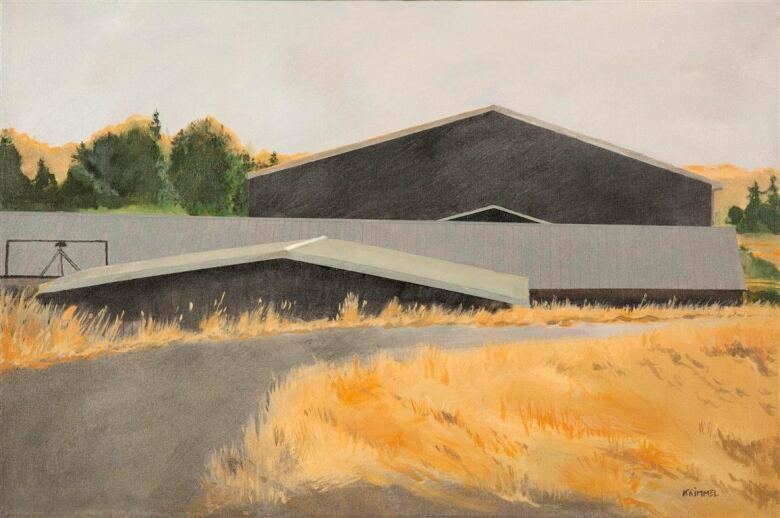 Forget mountains, ponds or sunsets: the Lower Mainland's endangered barns are the stars of a new exhibition by artist Kristin Krimmel. 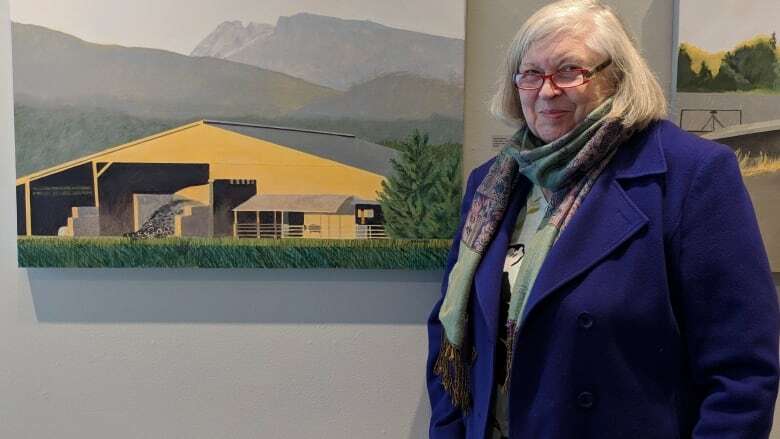 "You need to see the barns to understand what this is about," artist Kristin Krimmel mused, driving along a foggy gray road near Maple Ridge, B.C. The veteran landscape painter depicted these common structures in an exhibition opening Sunday at The Fort Gallery in Langley, B.C. It might seem mundane, but for Krimmel, these portraits are an ode to the area's persistent beauty in the face of constant change. Krimmel points to a patch of land outside. Once upon a time, "a family would live in that farmhouse and would spend most of the day in the barn," she tells CBC Radio's On The Coast. But urban sprawl, she says, means many of these structures lay dormant or have been converted for other uses. "Barns are no longer used as barns." Krimmel is content with wondering about their evolving natures from a distance, meditating on the barns' steady impact on the area's forested planes — even as these rural fixtures are torn down, renovated or left to rot. "I have not wanted to intrude on people's lives," she said. "I like these things for their forms and shapes." Letter-sized graphite drawings and larger acrylic paintings make up her 12-piece exhibition, a project that began over a decade ago when Krimmel first moved to Maple Ridge. Since then, she's seen traffic lights spring up on what once were quiet country roads. But amid the encroaching signs of urban development, Krimmel found herself photographing what remained of rural life. "The very first time I knew I was going to live in this community, I started noticing the various agricultural setups," she said. She'd pick out her favourites, noticing their angles and what they looked like saturated with sunlight or cloaked in shadow at dusk. "I think that's what has happened with this exhibition," she says. "The landscape is a part of who I am now. It's like an intimate friend I'm describing." 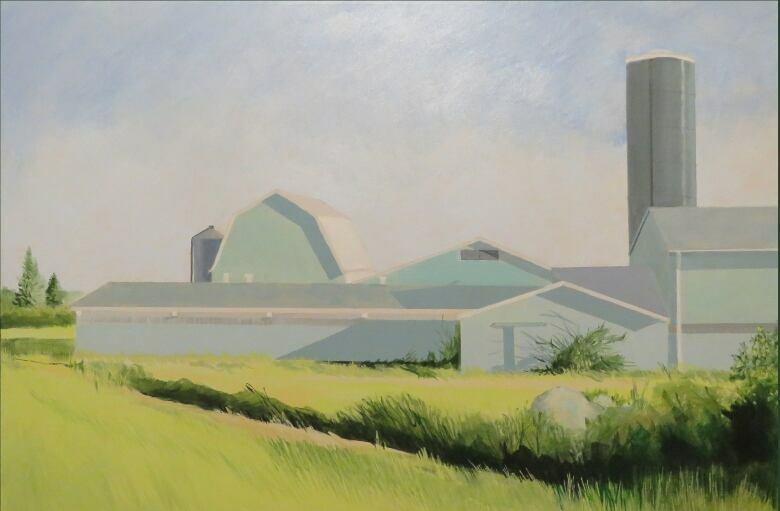 Despite the magnetic draw of each farm's history, Krimmel curates her work, choosing a subject for its compositional value as much as its character. "There's a juggling with an artist. It's not just to record every barn. It's to find something that will also make a beautiful painting." She points to a grove of poplars obscured by the fog. "My eyes are trained to see the beauty in things," even in rain, snow or various states of industrial flux, she says. The Barn Project "fits an aesthetic I have, of modern day objects we quite often don't see," she says. "And really they're quite beautiful in one way or another."